On Monday at 7:15 PM the Chicago Film Society and CHIRP Radio will present a rare 35-millimeter revival of Robert Altman’s Popeye at the Music Box Theatre. This is surely the most important revival screening of the week, a chance to see an unsung American masterpiece in the big-screen environment it deserves. (Incidentally, the week’s second-most important revival—Doc Films’ 35-millimeter presentation of Alan Rudolph’s Remember My Name, playing Thursday at 9:45 PM—was produced by Altman.) The film remains remarkable for possessing one of the greatest brain trusts in American movies. 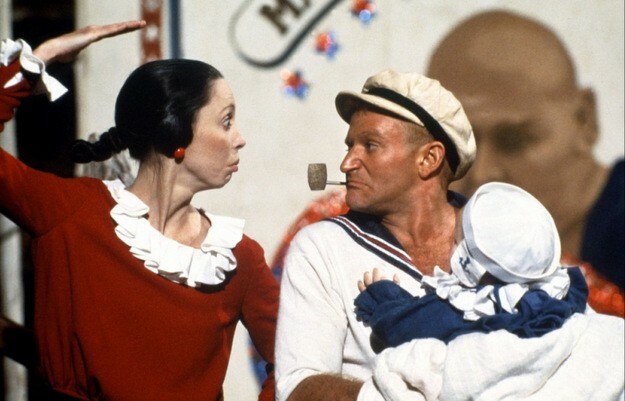 Not only was it directed by Altman; it was written by the brilliant cartoonist Jules Feiffer, shot by the great Italian cinematographer Giuseppe Rotunno (whose credits include multiple films for Luchino Visconti, Federico Fellini, and Mike Nichols), contains songs by Harry Nilsson, and the inspired cast features Robin Williams (as Popeye), Shelley Duvall (as Olive Oyl), Ray Walston, Paul Dooley, and a number of limber circus performers. The contributions of these artists combine to form something much grander than the sum of their parts—the film may be the most operatic comic-strip adaptation ever made. 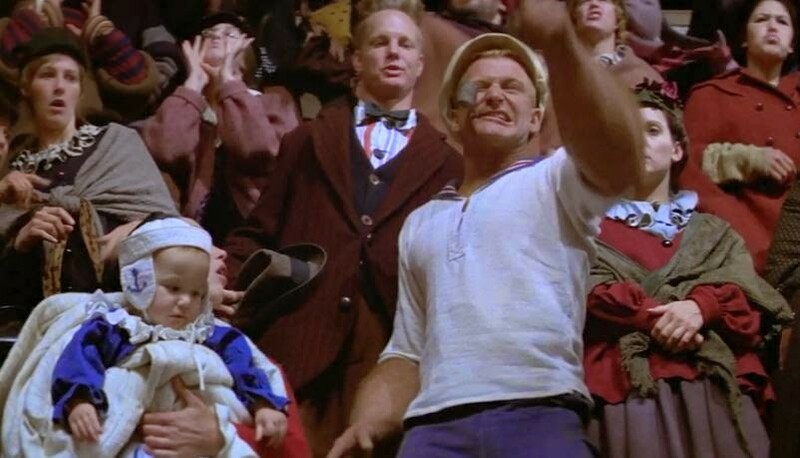 Popeye’s operatic nature owes much to Altman’s direction. Like many Altman films, Popeye is overflowing with human activity, with characters doing interesting things all over the wide-screen frame. (The big-screen presentation will surely do justice to the director’s grand vision.) The film conveys a God’s-eye view of society at work and play, the various little activities adding up to a mosaic-like portrait. Rotunno’s framing is superb (not surprising, given his work on such epics as The Leopard), organizing the players in compelling ways. Dave Kehr, in his negative review of Popeye for the Chicago Reader, compared it to Altman’s McCabe and Mrs. Miller, and it shares with that earlier film a fascination with society under construction. The town of Sweethaven, where Popeye takes place, is a fantastic creation. Built on the rocky crags of Malta with wood imported from California, it feels both ancient (because of its topography) and new (because of the recently constructed buildings). Altman’s greatest gift as a filmmaker may have been his ability to forge a sense of discovery (he famously encouraged improvisation on his sets, so that he’d be surprised by the onscreen behavior), and here he conjures a childlike sense of wonder in exploring an imaginary world. That world is modeled after the one E.C. Segar created in his Thimble Theater comic strip, which debuted in William Randolph Hearst’s newspapers in the 1920s. (Feiffer, possessing an encyclopedic knowledge of comics history, looked to the original strip for inspiration rather than the Fleischer brothers’ Popeye cartoons.) Yet thanks to the nuanced production design, it doesn’t feel like a slavish re-creation. One also gets a sense of how the people of Sweethaven live and interact—the film has a recognizable human element. Still, there’s a wonderfully cartoonish nature to the dialogue. Feiffer apes Segar’s mannered prose brilliantly—you can practically see speech bubbles coming out of the actors’ mouths—and the improvisations (particularly Williams’s) flow naturally with the scripted lines. Recounting the production of Popeye in Mitchell Zuckoff’s oral biography of Altman, Feiffer notes that he pushed the director to balance the scripted dialogue and improvisation during the editing of the film (at first Altman leaned heavily on the latter), and the results have a polyphonic quality. Nilsson’s songs, of course, add another layer of musicality to the film. They’re great in the way that Nilsson’s songs were usually great—the melodies are memorable, the orchestrations (by Van Dyke Parks) lush, the wordplay entertaining. Nilsson’s music often had a childlike playfulness to it, and he brings this quality to Popeye in spades. His lyrics here are greatly enhanced by the contributions of his collaborators. Feiffer worked closely with the songwriter to ensure that Segar’s language factored into the lyrics, and as a result the dialogue blends into the songs, and vice versa. The lyrics can be comically simple (as in the wonderful diner number “Everything Is Food”) or endearingly plainspoken (as in Olive Oyl’s romantic numbers “He’s Large” and “He Needs Me,” the latter famously sampled by Paul Thomas Anderson in Punch-Drunk Love), and they always feel like something comic-book characters might sing. Altman stages the musical numbers like he stages everything else, cutting between the lead performers and peripheral activity so that one considers how the songs affect the entire ensemble. And what an ensemble! Williams and Duvall are perfectly cast (their broad expressions really suggest comic-strip characters brought to life), but special mention should be made of Dooley’s characterization of Wimpy the hamburger fiend and Walston’s performance as the Commodore. Neither actor is still for a moment in the film, filling out their roles with funny little gestures that suggest the constant intervention of a cartoonist’s pen. Consider the way Dooley attempts to walk off with a burger during “Everything Is Food,” how his fingers dance over the sandwich and how his silly totter conveys a childlike sense of self-satisfaction. His behavior is so wonderful that you don’t even realize it’s the setup for a gag; Wimpy is so busy luxuriating over his stolen sandwich that he doesn’t have a chance to eat it before a chef takes it back from him. The film is full of countless such behaviors, giving one almost too much to take in at any given moment. (Popeye definitely gains from multiple viewings—it's too bad the Music Box is showing it only once.) Yet one is never distracted from the central story, in which Popeye comes to Sweethaven, enters into a relationship with Olive, searches for his long-lost father, and adopts an abandoned baby. The cast invests these conflicts with recognizable emotion, bringing an authentic sweetness to the broad material. This balance between sweetness and slapstick, exaggeration and refinement makes Popeye a unique achievement. It’s also one of those rare films that’s ideal viewing for all ages. The narrative, humor, and melodies can be appreciated by children, while the synthesis of the various creative elements creates a self-contained world that should spark the imagination of any adult. Popeye is not showing in any theaters in the area.